Supports all 32 & 64 bit Outlook Versions: Outlook 2016,2013,2010,2007,etc. PST Merge software provides 3 advanced option to combine multiple Outlook data files. Join Multiple PST files: It allows user to join outlook pst files by creating new Outlook data file. Merge Multiple PST Files: It Provides features to combine multiple PST file of similar kind. Merge Contacts Only: It simply allows to consolidate contacts of multiple Outlook PST file. Outlook PST Merger software provides option to add data into newly created Outlook PST file. It does not harm or effect the data while merging 2 PST files into single file. It easily combine ANSI file & UNICODE PST file into single Outlook data file. The software supports the ANSI file created by Outlook version 2002 and below and efficiently merge them into single UNICODE PST file. Merge PST file software retains the data integrity of the PST file. The data in the PST file remains the same before & after the completion of combining multiple pst files into one. PST file combiner software provides option to remove duplicate items from Outlook data file while combine two archive.pst files. For the same you need to check or uncheck the remove duplicated checkbox. 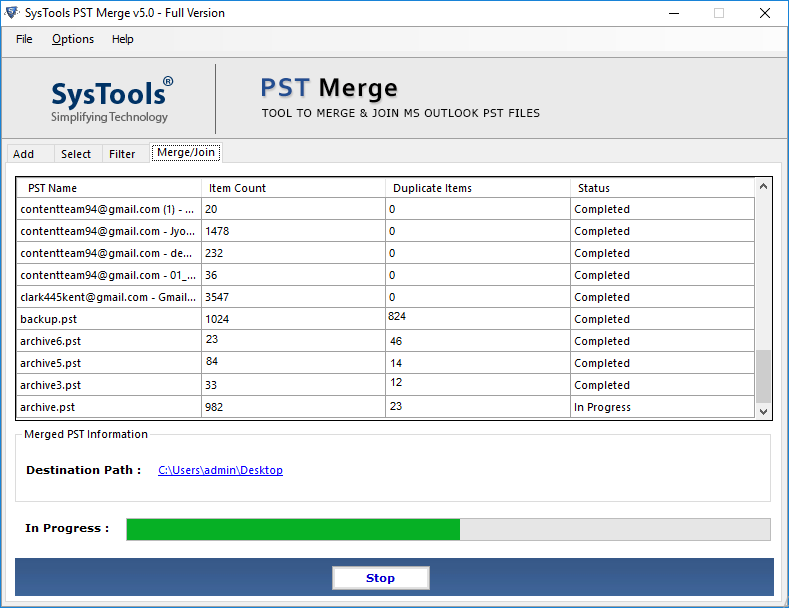 PST Merge Tool provides the functionality to include or exclude deleted items of Outlook PST file. To enable this option, you need to choose this option prior to join Outlook pst files. 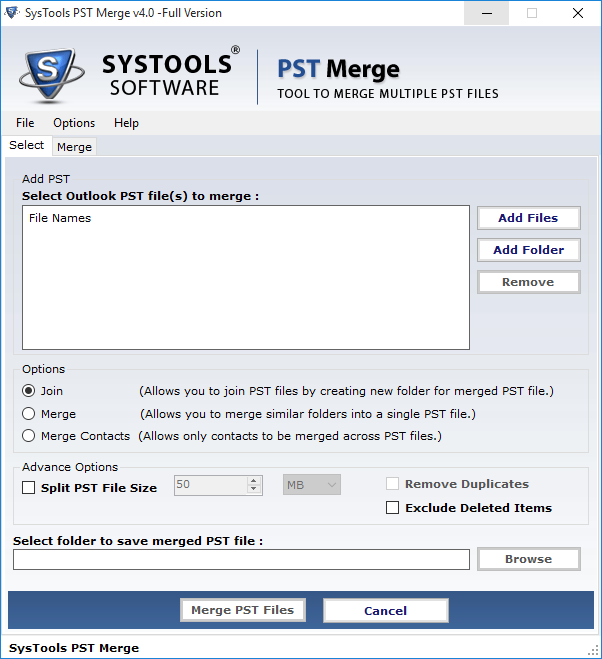 PST file merge software provides advanced feature to split resultant Outlook data file. By enabling this option merge PST file software automatically creates multiple smaller PST file of desired size. Free Download PST Merge utility to be aware about the software functioning and features beforehand. Join PST Limit: Join the initial 2 folders of each PST file. Merge PST Limit: Merge only first 15 items of each folder of PST files. 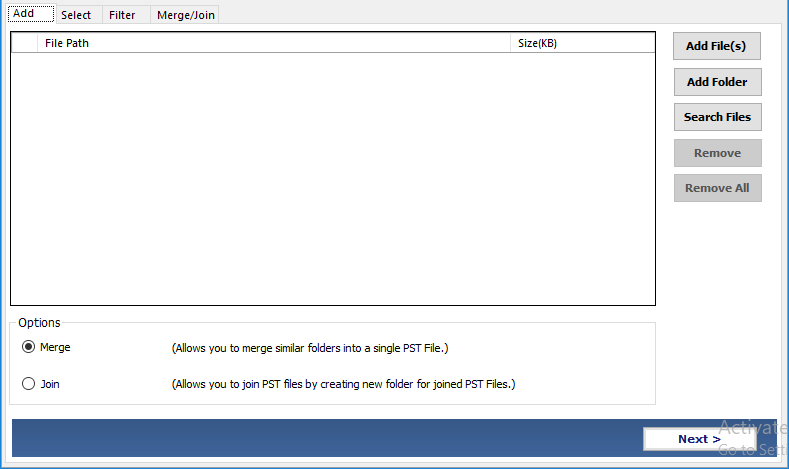 Merge Contacts Limit: Merge only first 15 items of each folder of PST files. Step1: Open & Start Merge PST Software. Step2: Add Outlook PST Files or Folder. Step3: Choose From Multiple Option i.e. Join, Merge & Merge Contacts. How to Combine Multiple PST Files? The entire data from the PST files will be kept safe when the merge process is carried out using PST Merge software. The short duration video Provides here will show the entire process of merging PST files with audio visuals. Watch the free online video and know how to merge multiple PST file in Outlook 2016, 2013, 2010, 2007. Once the entire process is viewed and understood, you can invest on the software via licensed version and proceed to combining multiple PST files into one without duplicates or limitations freeware. 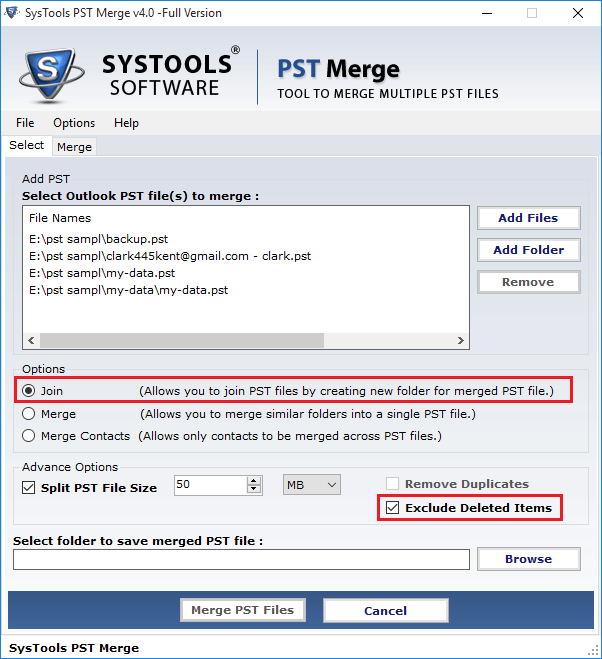 PST Merge which allow users to merge multiple Outlook PST files to a single PST files. Software merges PST files with all of its items such as emails, contacts, journals, notes, tasks, calendar entries etc. How Does the Merge PST Software Works? First, download and install the PST joiner and click on add file icon from the navigation bar. Then, select an appropriate Outlook format and choose the option for merge PST file. Next, click on the next button. Then, upload the .pst file and set a destination location for output. Finally, select a multiple merge option and click on the next button. Then, select merge pst file given on the final screen. How long can I use the free trial versions? Only first three folders from the selected PST file can be merged using the free trial of PST File Merge Software. IS it Possible to merge the password protected Outlook PST file? Yes, this is possible if the password is known to the user otherwise it will give the error message: "File Access is denied. You do not have the permissions to access the file. How much time will software take to join 15 files? Time taken by the software to merge/join multiple outlook PST files totally depends upon the number of PST files and their respective size. Does your PST merge software compatible with latest Outlook version 2016(64 bit)? Can I save merge PST into new folder? Yes, after combining the PST files, you can save it in your machine at any desirable location or you can create a new folder from the software panel itself and save the merged PST file directly into that folder. The club PST File software will save the merged PST file with a default name i.e. outlook.pst. How can software retains data integrity? In what format (ANSI and UNICODE) does the combined output PST file gets restored? 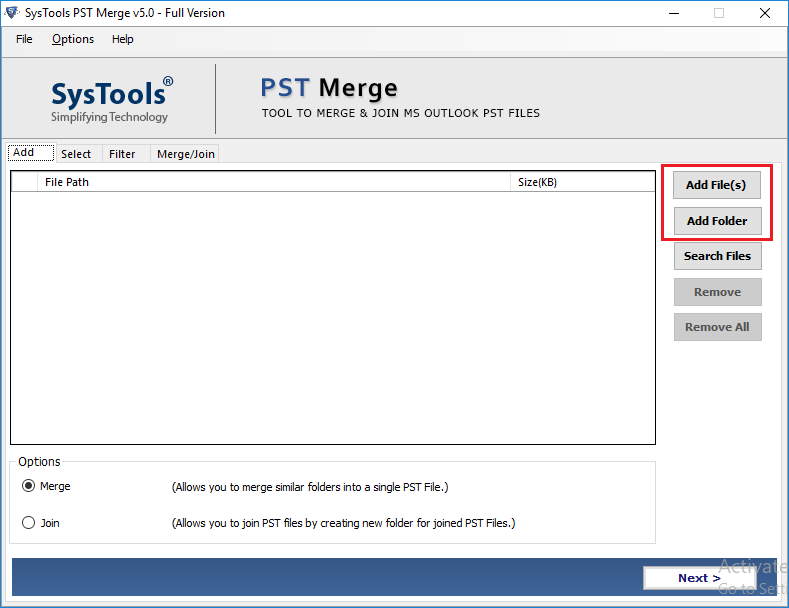 This PST merge Software save the output merged PST File in UNICODE file format, which can be easily and safely be accessible in both versions ANSI and UNICODE from Outlook 97 to Outlook 2016. Does your software support corrupted file for merging? "I think I found the perfect software to merge Outlook PST file. At first place, I was just thinking that I could really use it or not as I am not technically good. But once I used it, I found it very comfortable. It helped me a lot. The customer service which you provide is worth appreciating. In one word, I would say that the tool is fantastic."